Silicone vs. Titebond background adhesion methods. My review. 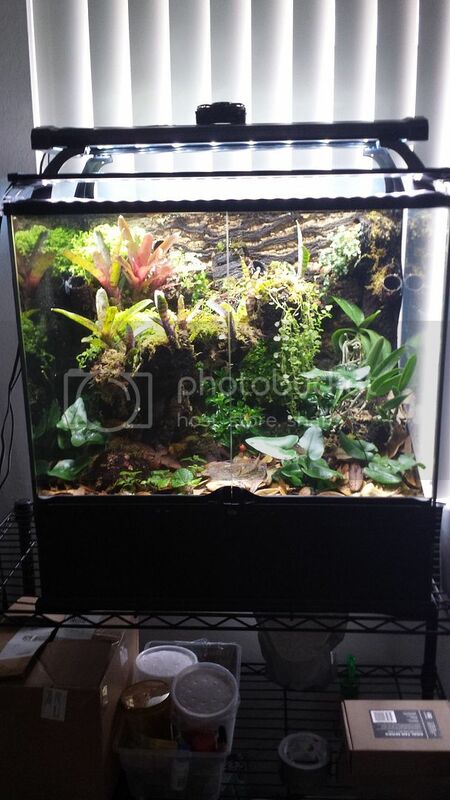 I just finished up my 3rd tank using the Titebond III method and thought I'd share some of my experiences to those thinking about using this on their next tank. My first 2 tanks used the traditional silicone method. Please note, for both methods I had used GS foam to create the shape of the background and it had been carved exposing the dull foam removing the shining surface. Also, on both methods, I used the same substrate, loose tree fern fibers, to cover my background. Material Costs: For an 18x18x24 tank I use about 3 tubes of aquarium safe silicone to cover 3 full sides. Costs me about $12 for 3 tubes (I'm in Canada BTW. All mentioned prices are in CDN dollars). A 3.78L jug of TB3 runs me about $50. Most of the jug was used to cover 3 sides. I have a little left over, but not even enough to cover a full side. Winner: Silicone. Handling: Silicone is easier to work with IMO. It grabs the background instantly and the substrate afterwards. TB3 requires you to pre-mix your substrate with the adhesive, separately, then apply to your background. When applying using TB3, it does not grab the background like the silicone does. Instead you are just placing it on top of the GS and holding it there with gravity. Coverage can be trickier with this method as previous materials seem to lift off as you at patting down adjoining sections. You need to wait a minimum of 24hrs before rotating the tank and doing the other sides. With silicone, I could do the next side within hours of curing the previous. Of course, after all sides are complete you need to let the entire background cure properly. I like to let both cure for a week, before I start planting. Winner: Silicone. Toxic: Silicone hits your nose hard, with a vinegar smell, like heavy dose of wasabi. Especially working with large amounts like we do when covering our backgrounds. Ensure you have good ventilation. TB3 has little to no smell. Winner TB3. Finish: This topic is subjective. It's all about what you're after really. I can only offer you my opinion. The finished background using silicone, allows the natural textures of your chosen substrate to remain intact. If I choose coco fiber, it would still have the same soft, fiber-like texture. Reason being is that the silicone only coats one side of the substrate rather than all over. The untouched side is the side visible to the viewer and inhabitants living in the tank. TB3, however, requires you to create a mixture of the adhesive with your substrate, coating all sides with the adhesive. When it dries, it leaves a coating on top of the substrate, almost like the clear coat on top of your car's paint. This coating completely removes any natural texture your substrate had to begin with. It leaves a hard rock-like finish, and when paired with tree fern fiber, also very sharp (I cut myself a few times, and scratched my arms up real good, reaching in the tank while planting). I personally don't like this. Like in nature, I'd rather have my vivs share a vast selection of textures, unaltered by a building material. Winner: Silicone. Water Resistance: If you had a running water feature on your background, I can only assume the silicone background would deteriorate, over time, faster than the TB3. I say assume, as these are fairly new tanks and I haven't put them to the longevity test yet. The TB3 claims to be better at water exposure on the label. I would have to agree because of this coating it creates. Winner: TB3. These are the top level things that came to mind when I was building my tanks using both methods. If there is anything I miss, or there are other questions you may have, I'd be happy to answer them. Me personally, moving forward, will stick to silicone. Cheaper, easier to work with, and a better finish (IMO). I'll just invest in better protection against the fumes. 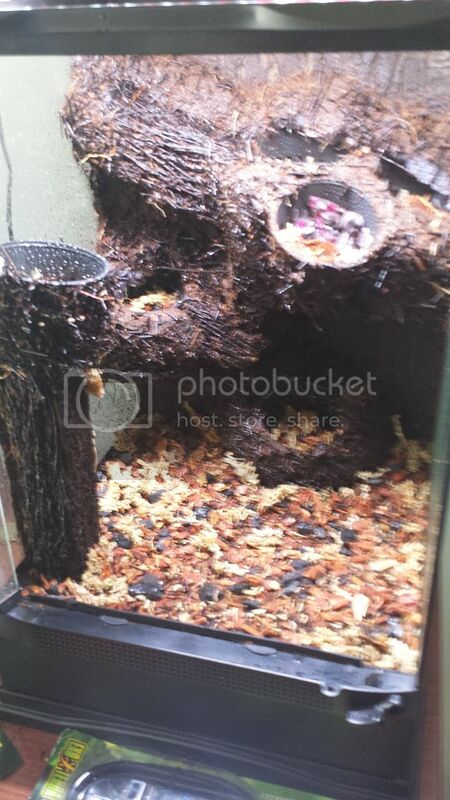 I am building a lot of tanks as I have dedicated a room in my house for these amphibians. Re: Silicone vs. Titebond background adhesion methods. My review. I really appreciate this post. I am on my 4th vivarium (if you count my first disaster) and was contemplating titebond as well. I am not a huge fan of 100% great stuff backgrounds due to the massive amounts of carving, silicone coating and mess it makes, but that's the price we pay for customization. Would you say one way is messier or takes longer to cure than the other? 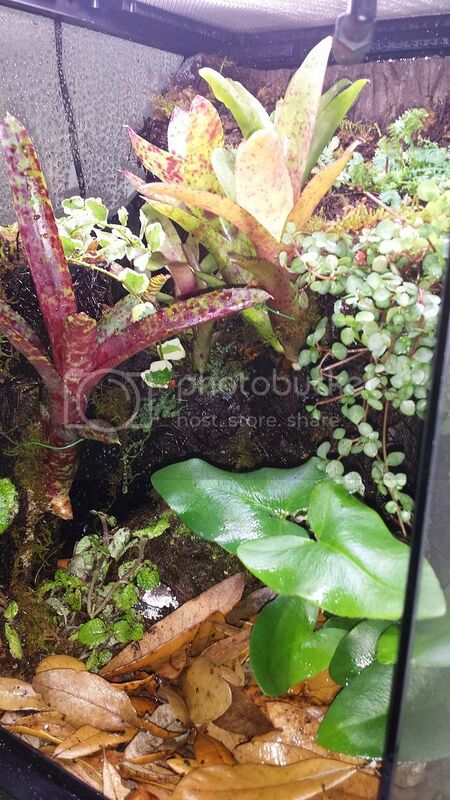 I use a pre-cut "cork tile" or "forest tile" and construct most of the background on that before even putting it into the vivarium. Helps with the weird angles in trying to cover the bottom of an overhanging ledge or something with silicone and substrate. Both are messy equally. On paper, silicone should cure faster. 24hrs. But in my experience it needed longer. I could still smell vinegar after 24hrs. I like to wait a week for both methods. I guess I'm using more silicone than I should. I'm contemplating using some cork tiles on my next background. I stayed away from it because I like the 3D shape of the GS backgrounds. Cork tiles seem too flat and unnatural to me. 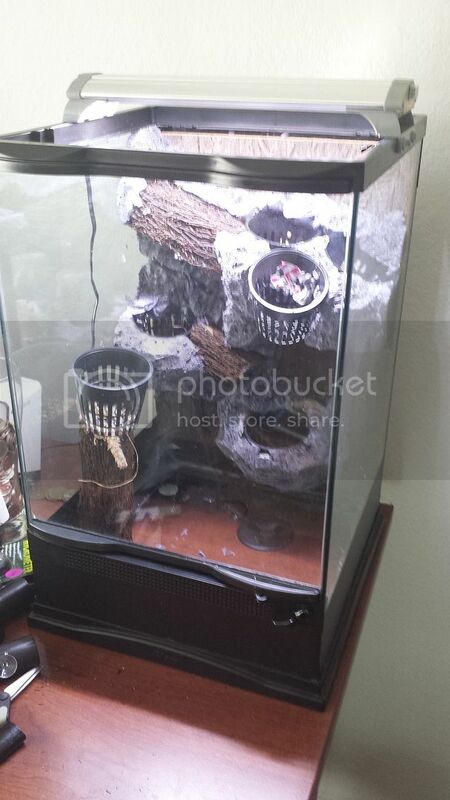 Do you have pics of your tanks with the cork tiles? I agree GS is more work and mess with the carving stage. But as you do more and more tanks, you get a good feel of how much GS to lay down. You can almost guess how much it will expand in the end. In the beginning tho, you usually put way to much. Carving more than 50% off. It is a waste of foam, but it's all part of learning. I've done both methods before, and also prefer silicone. The biggest piece of advice that I can offer, and ulyssis also mentioned is to carve or scuff up ANY AND ALL shiny surfaces on the GS. I used Great Stuff on the cork tile. That way I got the best of both worlds. Lower footprint of the cork tile background plus the customization of great stuff. Plus carving/scraping GS outside of the vivarium on a moveable piece of cork tile is priceless. 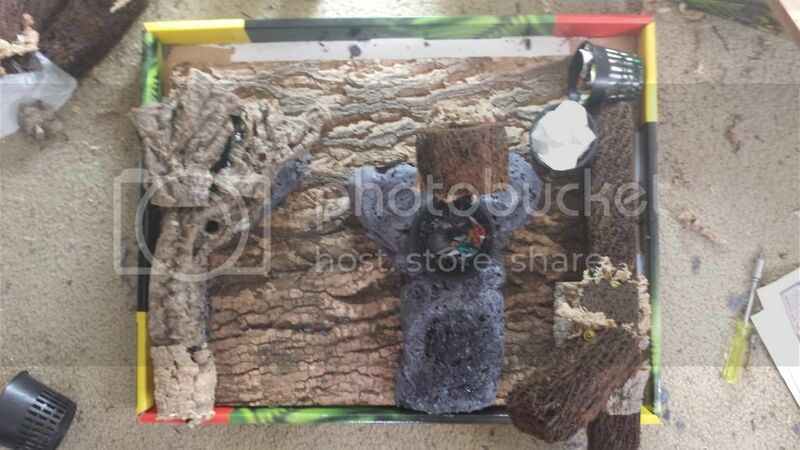 Here's a 12x12x18 Cork tile background with 3 levels of great stuff, tree fern totem pieces and net pots. The foreground totem and net pot are just siliconed to the glass. You keep writing that you have to mix your substrate with TB3. No you don't. I use black expandable foam (if portions of foam are not completely covered, it's black, it looks good). I then brush on about a cup of TB3 and then press in virgin peat moss. 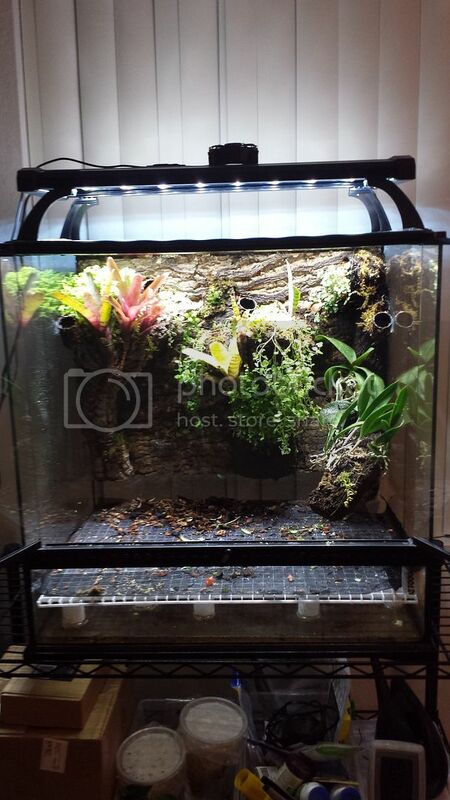 24 hours later, the viv is ready to go. Try that method and you will never go back to mixing your substrate it use silicone. I thought with the TB3 the point was to avoid the GS foam? I have read so many methods lately that I am starting to get them confused. I think I am going to try that clay product being sold on ebay. Most people use TB3 to coat GS in the portions of their water feature. It is similar to a concrete paste. It is great for sealing/texture, but not so great to create 3D shapes like Great Stuff. You can also coat other areas of the hardscape you want to seal or add texture to like branches, pvc pipes, rock waterfalls, etc. If you are using GS I too recommend the black 'pond' great stuff because it doesn't show through like the yellow normal kind. Titebond III is a PVA wood glue and has nothing to do with concrete. It is water resistant when dry not water proof. It should not be used as part of a water feature where it will be in constant contact with water. If you want to properly seal something that will be in or around water constantly you should use drylok as it is actually waterproof. Never knew about that method. All I ever read about was told was to create a thick mixture with the TB3 and your substrate. Maybe I'll give TB3 another chance. I'm assuming I can use any substrate with your method? Do you have a pic of the peat moss background you speak of? I'm curious to what it looks like. Also, does it create a rock hard coating still? It's hard when dried. It becomes a thin shell over the expandable foam. If you PM me your cell number, I'll send you pictures.